The sunlight broke its way into the unlit room through the small holes in the hot metal roof, creating tiny beams of light that felt like peace dancing down on us from above. The shutters were pulled open on the three of the four small windows, where a few children had climbed into the windowsills from the outside to catch a glimpse at the ‘obrunis’ who had gathered inside. Those who didn’t grab the coveted window seats fast enough stood curiously watching from the doorway, as though unsure if they should stand outside or come in, but not wanting to miss anything either way. When we had arrived moments earlier, the boys ran out to the road to greet us as we stepped out of the van, throwing their arms around me, quickly followed by their parents, their welcome as warm as the mid-day sun. The boys had grown so much. We had visited them a little over 5 years ago within a month of their 6th birthday, their tiny bodies so small we easily carried them in our arms, and now here they stood at the age of 11, tall and lean, their heads reaching the height of my shoulders and their faces showing recognition. This time, they knew exactly who we were, and were so excited to see us. Some things hadn’t changed – I still had some trouble telling them apart. 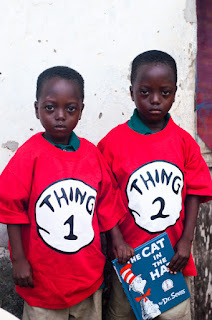 They had outgrown their Thing 1 and Thing 2 shirts from years ago and now stood in matching uniforms, daring me to guess which one was which. “Easy!”, I quipped. “This one is George Essel Botchwey,” I said, pointing randomly to one of them, and then pointing to the other… “and this one is George Essel Botchwey!” A few chuckles rang around the room from their family. Yes, these two identical boys also shared the same first name, middle name and last name. My saving grace was the twinkle in the eyes of the boy with the ever so subtle mischievous smirk – I knew he was mine. 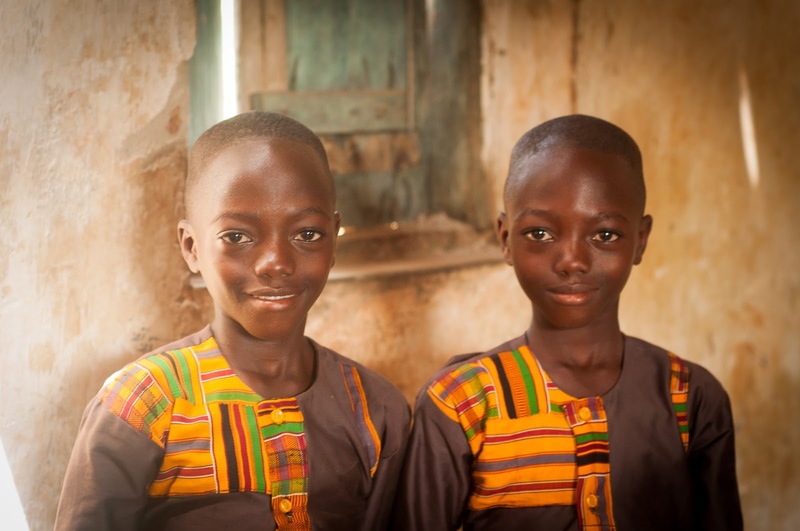 “Panyin”, meaning older twin, was the nickname given to all older twins in Ghana. Kakra (meaning younger twin) was sponsored by a friend of mine. 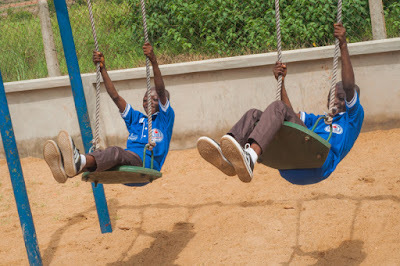 Incidentally, the boys wore different colored flip flops – the ones worn by Panyin were green, matching my eyes. 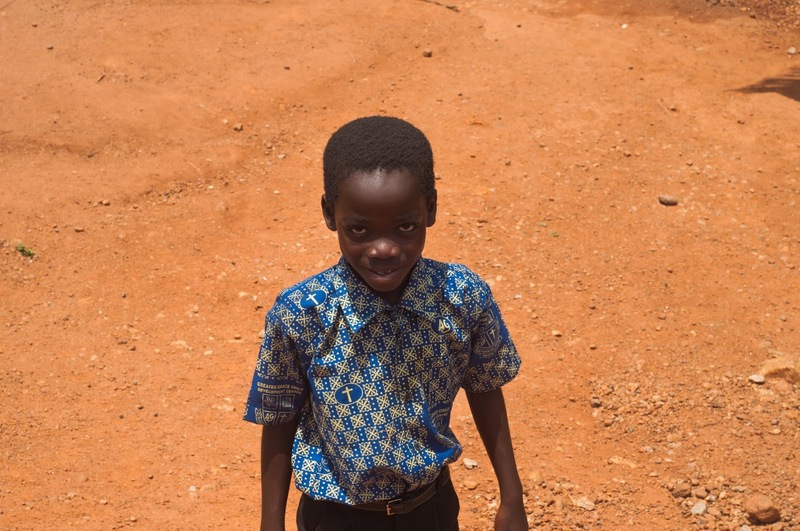 The ones worn by Kakra were blue just like his sponsor’s eyes. That would make it a little easier for me to tell them apart. No one else seemed to have the difficulty I did! The boys’ mother, tall and lean just like them, sat across from us with radiant peace and joy etched deep into her youthful face. She hadn’t aged at all, in fact, if anything, she looked younger. Her husband leaned in, completely engaged into the conversations as he had been on our last visit. 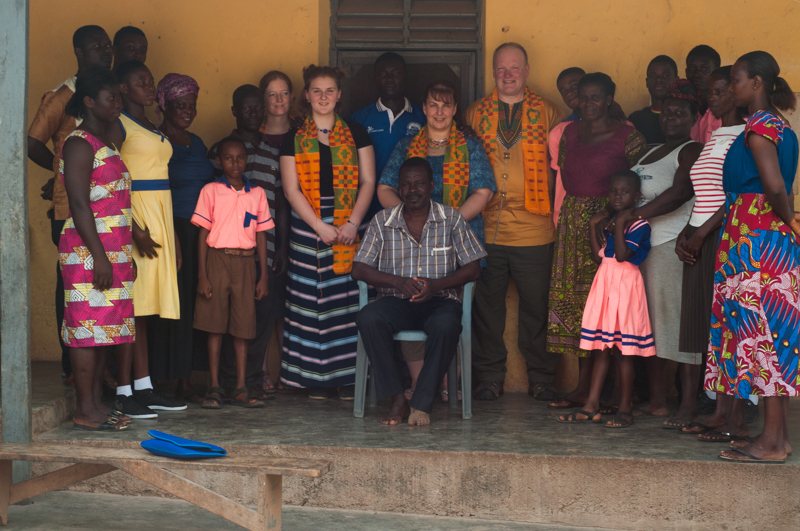 We all talked for a while, shared our purpose for our travels to Ghana, and our gratitude at the opportunity to visit them again. We joked a bit about the heat, explaining how different it is from the climate back home, where it feels as much below the freezing point as it was above the freezing point in Ghana. Every few minutes, a hint of a breeze would blow through the open window and all too quickly disappear. At the end of our visit, we provided them with the groceries we had bought for them, and a handful of books for the children to share. We also gave them Lego blocks, quickly showing the curious Georges how to use them to build things, hoping this would make sense to them. Legos were a rare novelty in Ghana. The family gave us the traditional gifts of Kente cloths and jewelry they had made, including an extra one us to mail to Kakra’s sponsor. Time slipped through our fingers all too quickly, as we found ourselves facing yet another goodbye. We slowly made our way back into the full sun, walking down the weathered concrete courtyard and onto the packed dirt leading back to the road where the van was waiting to take us to our next home visit. Squeezing in a few more hugs and bittersweet goodbyes, we climbed back into the van, and watched as they made their way back to their family courtyard... the mom stealing back one last glance as we pulled away. How do you pack enough love into mere moments to last a few years, to convey how much they mean to us, how much we appreciate their letters and how thankful we are to be counted as family? Such beautiful, warm people, living out immeasurable peace in such a harsh and at times unforgiving environment, living on the edges of extreme poverty. The purity of their peace pierces my heart like the sunlight pierces through their thin roof, spilling light into every corner within. It's really no secret -- when we're fully surrendered to Him in all our circumstances, darkness truly doesn't stand a chance. There is nothing quite like the simple joy of hearing children's laughter. Especially when it is coming from children who are playing on a playground for the first time in their lives. Today was a day of firsts. 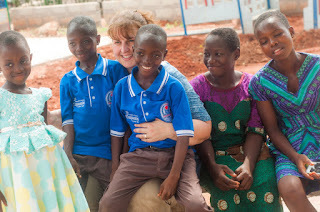 The biggest first was the opportunity for us to be in the presence of all of our sponsored children from Ghana at the same time. It was also the first time we've met two of our children in person... 19 year old Victoria, and 7 year old Maaatta. For several of the children, it was their first time traveling to Accra. 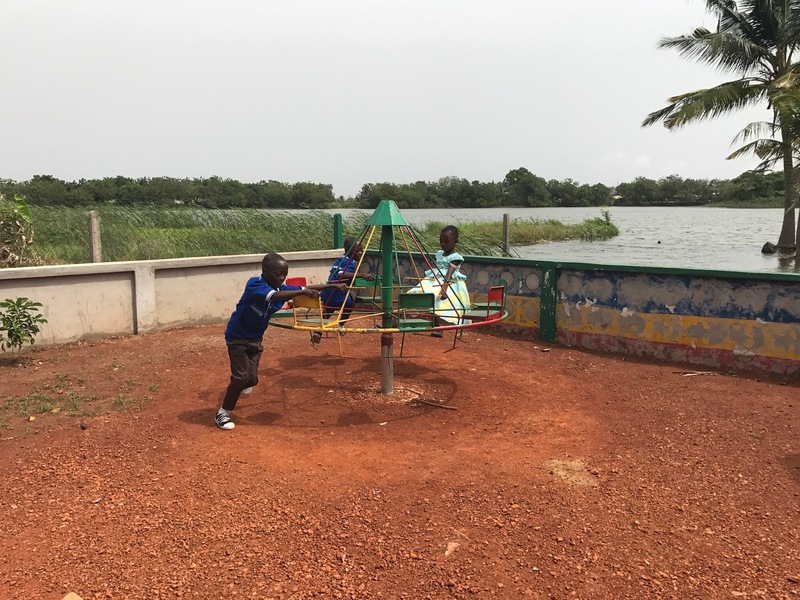 We had made plans to meet at a marina/park in Accra for the day, so many of them traveled several hours to join us. 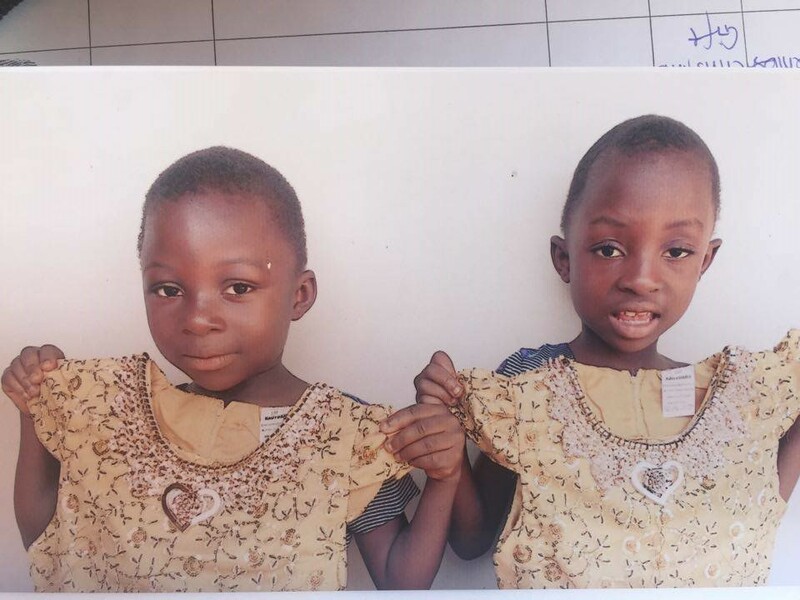 Although the twins have been together their entire lives, and Ato Sam and Tahameena have known each other their whole lives as well, the rest of our Ghanaian children would meet for the first time. Tahameena saw live fish for the first time in the park's lake. Ato Sam and Tahameena took their first paddle boat ride. 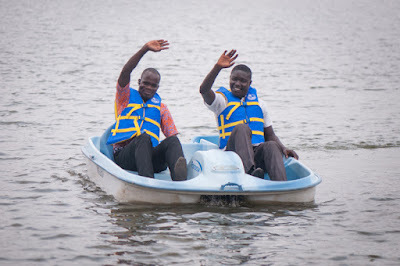 They had never been on a boat of any kind before. 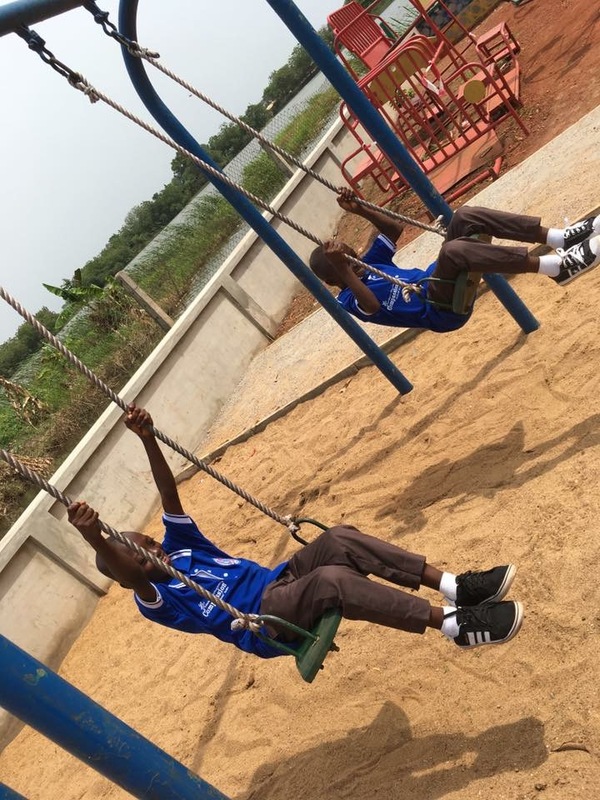 Some of the sponsored children had never played in a playground, some of them tried swings, slides, merry-go-rounds and monkey bars for the first time. 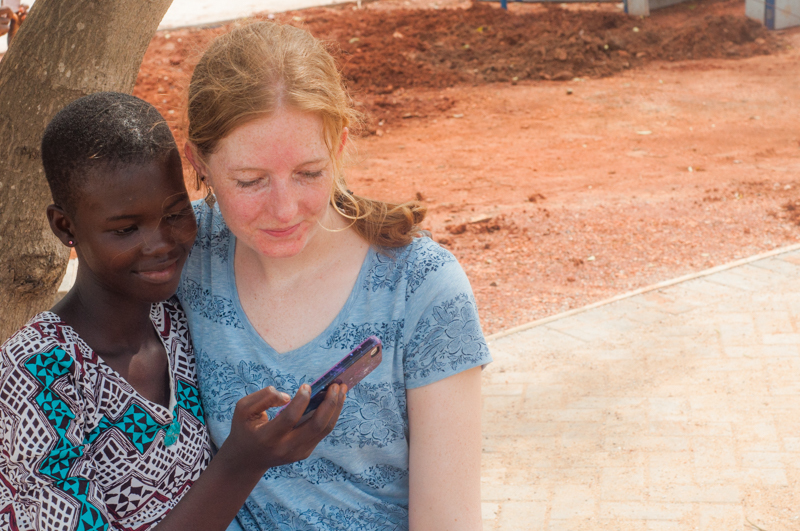 Our team member from the U.S., Caitlin, met her child Abigail for the first time. I heard Maaatta laugh for the first time, and discovered that she had a twin sister. I had my first opportunity to sit and talk at length with Ebenezer, the Director from the Compassion project in Enyan Abaasa. Tahameena had her first chance to use a camera when I let her borrow my camera phone. Ato Sam tried Will's Indiana Jones hat for the first time -- and kept it on all day. My Ghanaian son, and his Canadian "mum"
At a glance, nothing seemed out of the ordinary. Yes, raw sewage gutters lined the side of the streets, separating the buildings from the road as far as the eye could see, with rickety boards or cement blocks placed across the gutters so that we could safely cross over to the buildings or merchant stands dotting the neighborhood. 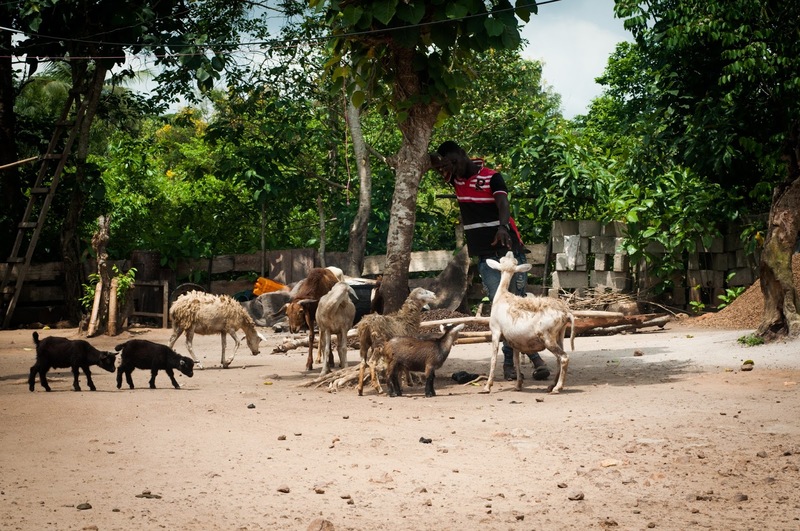 This was Ghana, and for Ghana, this was pretty typical whether you were in Osu, an urban, bustling part of Accra, or in a small community such as this. In the months leading up to this trip, I had researched many of the challenges facing Ghanaians, and sanitation was near the top of that list. Being married to a plumber, I knew that he would take interest in knowing how Ghana manages this concern compared to the way it is managed back home. 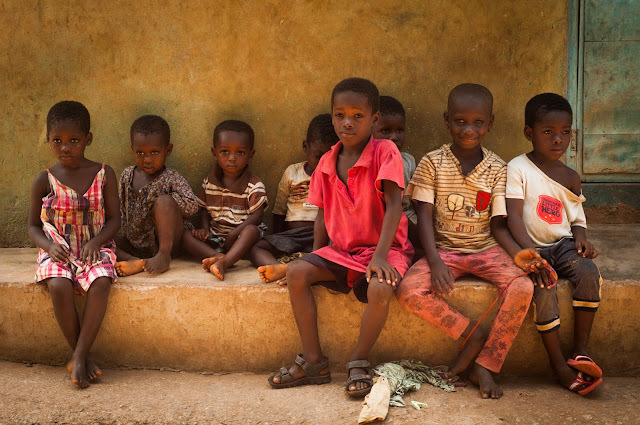 Only roughly one third of Ghanaians have access to some form of sanitation infrastructure such as toilets, pit latrines or other means, and most of the sewage in Ghana is not processed in ways that reduce the impact on health and environment. It is an unthinkable but well known fact that it is easier for people in extreme poverty to access a cell phone than a toilet. The local pastor led our team across the gutter under the watchful eye of a nearby merchant selling her items a few feet away. 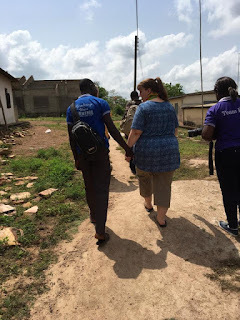 Once across, we entered a small concrete walkway between two buildings, much as we’d done earlier when visiting the home of Prince, a sponsored child from Enyan Abaasa. Even the yellow walls were the same color they’d been in the walkway near Prince’s house. Really, nothing seemed out of the ordinary… but two things we’d been told in preparation for this visit made us wonder what we’d find on this last home visit. 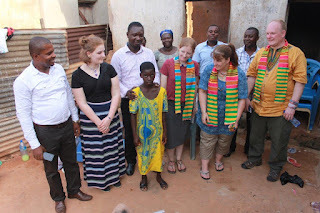 We were here on behalf of Beth, a sponsor from the US who had some concerns about her sponsored child, Vivian, who lived near the area where we were working this week. Beth had shared with us that the letters from Vivian were very basic and repetitive even after a few years of sponsorship, leaving her feeling very disconnected and concerned as a sponsor. 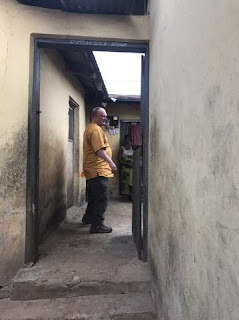 We contacted Compassion ahead of time and asked if there was any way we could get to speak to the child development workers and to meet the child and her family while we were in their area. Compassion did their best to work this into our already full schedule, and that was what had led us to this small community in the Central Region. Just before we drove to this area where Vivian and her family lives, we dropped by the local church office where the Compassion staff met with us for a few moments. Vivian is registered with this Compassion affiliated church. 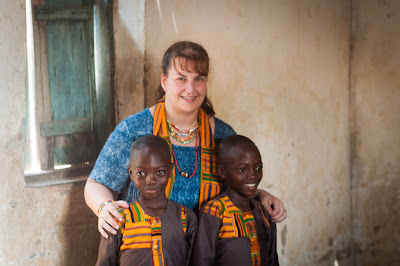 One of the district supervisors, Samuel, had been our Compassion host when I traveled to Ghana in 2011. It was great to connect with him after all these years. 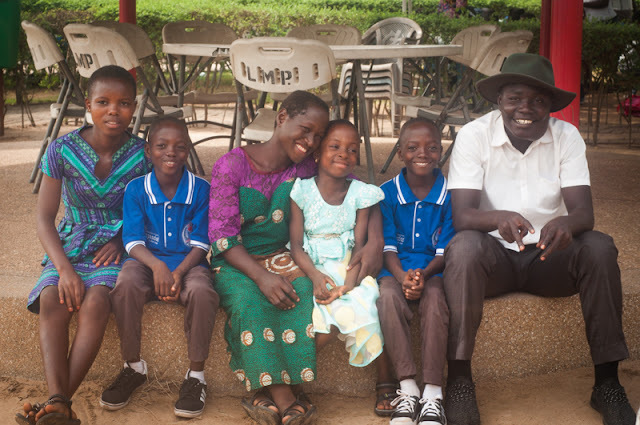 He was glad to see us back in Ghana and to hear of the journey that had led us here, and he gave us the opportunity to go through Vivian’s file, much as we had done with our own sponsored children. Looking through Vivian’s file, we could tell that Vivian struggled in school, and that the letters were indeed reserved and guarded. We asked the staff about Vivian’s family situation, and rather than to simply answer, the workers looked at each other, their expressions telling us that they were looking for the right words to convey that things were very difficult in Vivian’s situation. 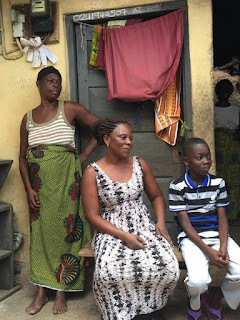 What they did say was that Vivian has developmental challenges and that as for the family situation, we would see for ourselves when we visited her home. 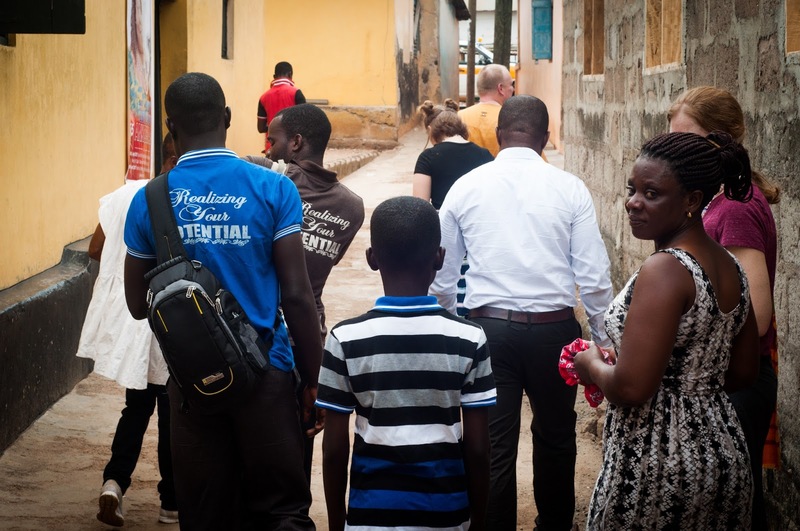 Walking single file between the aging, yellow walls of the buildings, groceries and gifts in hand for the family, we followed our leader as he led the way to Vivian’s home. Turning around the next corner, the smell of raw sewage rising with the heat waves hit us full force. 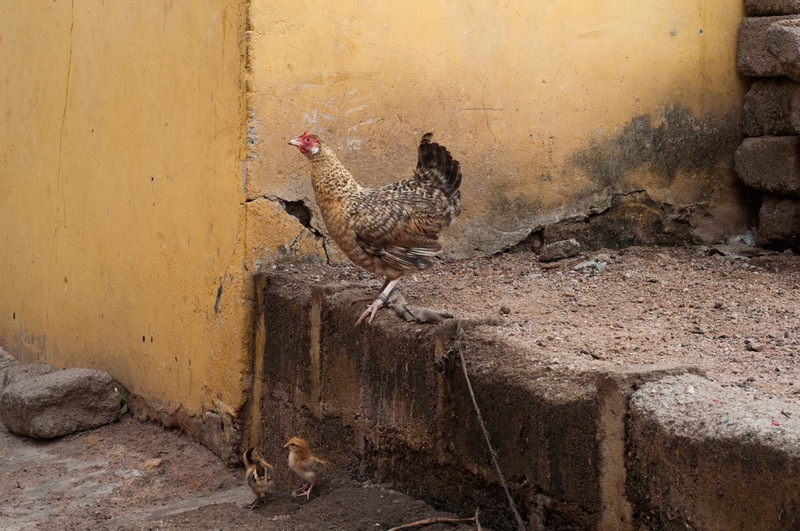 We looked at each other silently as we kept going, sidestepping a stream of raw sewage flowing from various places and pooling in the dirt paths leading to different homes, while chickens pecked at the dirty ground looking for something -- anything -- to sustain themselves. A few more turns later, we saw a group of sparsely clothed, barefooted children playing in a small rocky yard surrounded by a small tightly packed cluster of homes with rusty metal roofs. Nearby, a beautiful young woman with an infant strapped tightly to her back bent low over a tub of soapy water, scrubbing clothes, and hanging them to dry above the stream of raw sewage. We stopped and climbed carefully into the yard. 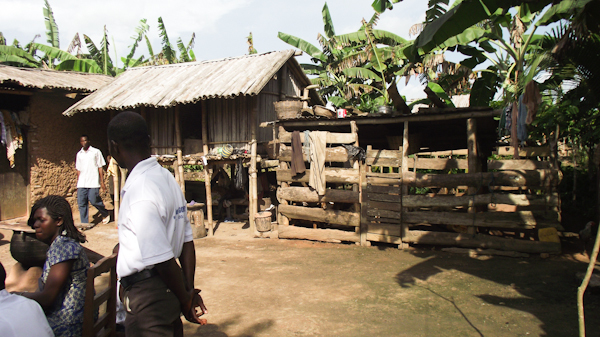 We had seen homes in poor state of repair all through our travels, including some of the homes we had visited earlier. There had been crumbling walls and holes in the roof at the twins’ home an hour or two earlier… and more. This, though… this was different. There was no peace. What there was in its place was palpable despair and disorder that we hadn’t experienced elsewhere that day, or on this trip. The home was in very poor shape, probably the worst we'd personally seen. The family dynamics were visibly strained. And mere feet away, raw sewage was snaking its way between houses where children walk barefoot and play. 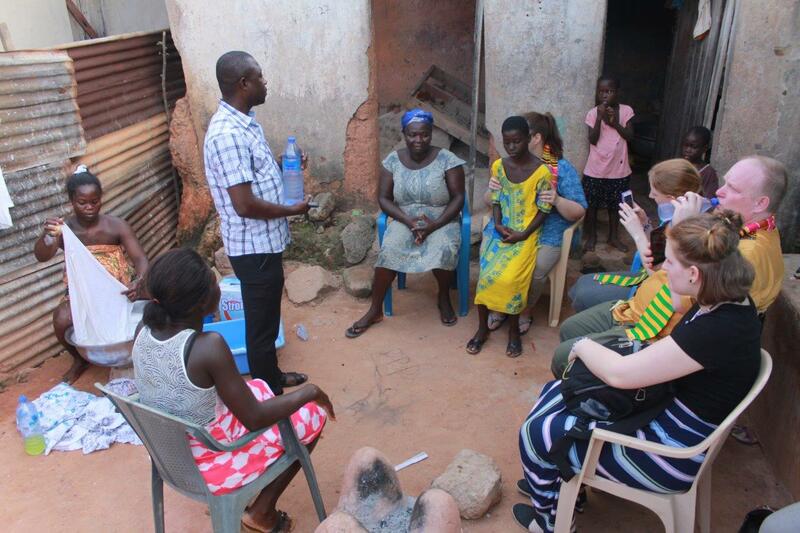 We quietly observed through the Ghanaian visiting rituals of introductions and exchanges. Vivian’s mother had several children and appeared to be expecting another child. Her countenance was distant and disconnected from the activities surrounding her. We had been told that Vivian’s mother was typically absent in the home, and that Vivian was being raised by Vivian’s grandmother. This helped explain the complete disconnect between Vivian and her own mother. Thankfully, Vivian's grandmother is warm, welcoming and provided the best environment she could for the children. Vivan’s aunt was the young woman with the infant on her back, washing clothes. The small, barefoot children we had seen when we first arrived were Vivian’s younger siblings, three girls ages 9, 7 and 5. 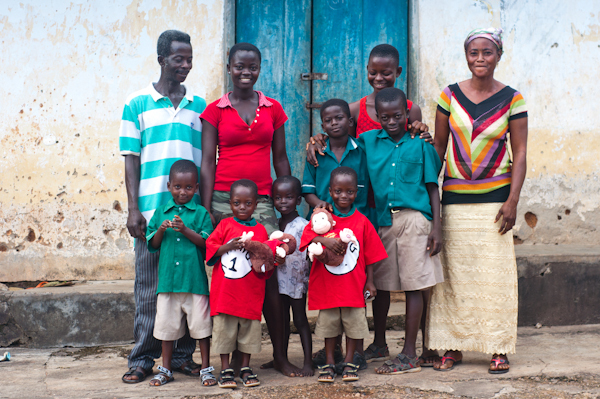 They were not part of the sponsorship program, but the oldest three children, including Vivian, do attend school. There were no male parental figures in the family; not a grandparent, father, or a husband present. When our leaders spoke to Vivian, she barely responded. She sometimes stared into space or at her feet until her grandmother repeated the questions directly to her. Sometimes, she would quietly respond to her grandmother, but sometimes, the questions were met with complete silence. She seemed like a shell of a child part of the time, and then at other times, she would come alive and be in the moment with a warm smile. It became clear as we were there why there had been such a struggle getting to know this child through sponsorship letters. When the time came for the family to ask our team questions as dictated in social customs, the local leadership addressed the grandmother and asked her directly what we wanted to communicate to us. 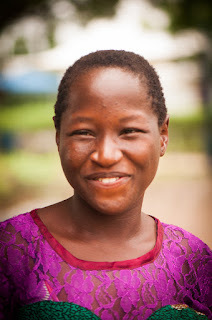 She gave a short but intense response in the local language we didn’t understand, and her words made our local leadership team visibly startle. Not knowing what she had said, or why it had unsettled the local team, we waited, anxious for them to translate her words to us. They did not immediately translate. We tried to coax them by telling us that we had a good sense of humor (nothing would surprise us!). Instead, they exchanged rapid-fire words among one another in an effort to determine what was appropriate for them to share with us, while also preserving the family's honor and dignity. What could she possibly have said? A few things came to mind… we knew from our advocacy work that families are not permitted to ask the sponsors for money or provisions, and we had also heard of desperate families in developing nations, especially Haiti, asking for visitors to take a child back to North America with them. In this particular case, the answer was closer to the first thought that came to mind – but it wasn’t a plea for money, it was a cry for help. 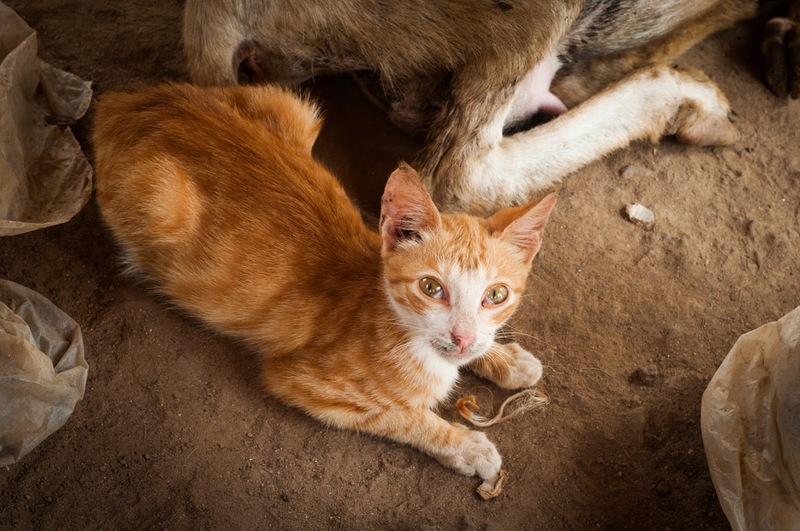 The grandmother is living in a really difficult situation, being left to raise her grandchildren without a husband to help her, without a source of income, in deplorable living conditions. 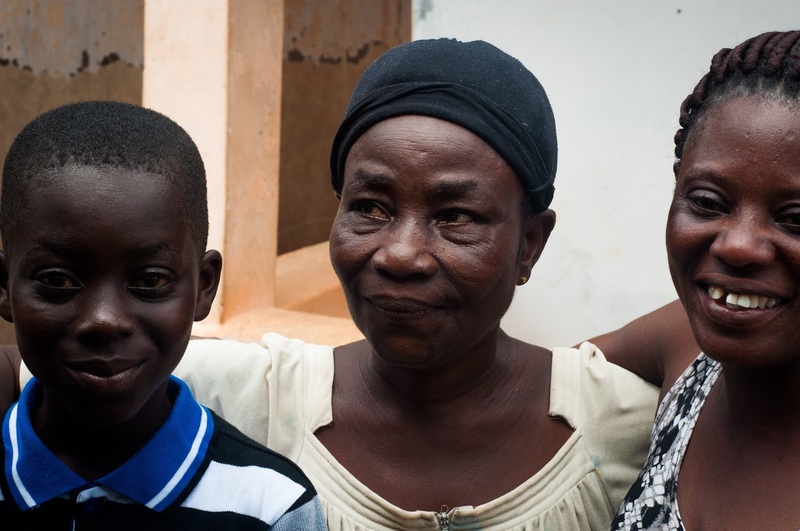 Given Vivian’s development delays and the family home environment being especially challenging, the grandmother was desperate for support, but specifically told the local leadership that she doesn’t want a handout, she wants help establishing a business so she could support herself and her family. It will take some time to determine what kind of skills she will require, what type of business she would be best suited for, and what it will take to help her get there. The local leadership is prepared to help walk her through the necessary steps to offer a long term solution, rather than a quick fix that isn’t sustainable. To do this in a sustainable way could take months, it could take longer. Given the severity of the circumstances, one of the most practical ways to help would be to provide additional resources through Compassion in the form of a financial gift specifically for this family, so that the local leadership can have access these additional resources to help this grandmother obtain what she needs to establish a sustainable source of income. Perhaps a small merchant stand, a sewing enterprise, bead making supplies, taxi service, etc. 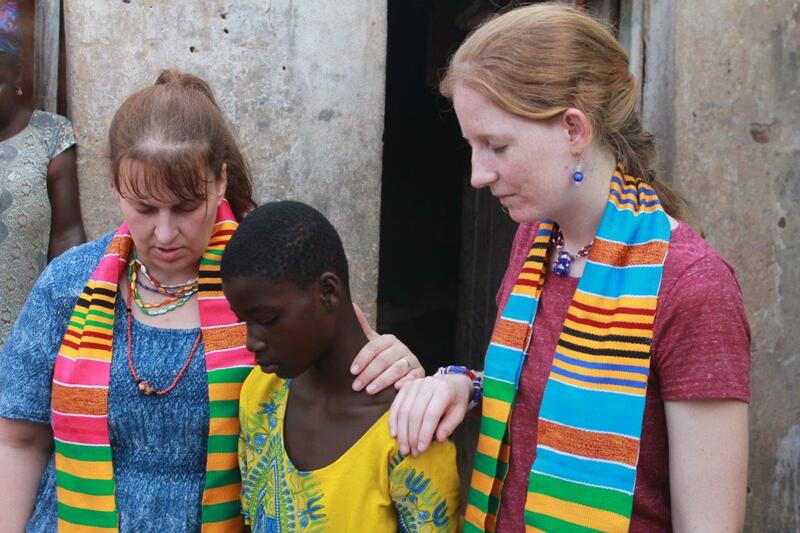 Our team members’ hearts were marked and burdened by this visit. Much time was spent debriefing in the van on the way back to the guest house, and in the days to come. Even now, back home, our hearts continue to be heavy for Vivian and her family. Traveling to Ghana (or any developing nation) for humanitarian purposes brings you to some of the hardest places and situations. There is extreme poverty nearly everywhere, and it can at times be overwhelming as we know we can’t help with every single situation we encounter, but there are times when we’re faced with a situation and know we are meant to be a part of the changes that brings the opportunities for a better future. The partnership we’ve had with Enyan Abaasa’s community in the past 7 years has been a great example of focusing on one community, and doing something to help meet their needs. It takes so little to make a positive impact in places like these. While in Ghana to wrap up the library project, we were able to determine what our next long term project will be, but in the days following the visit to Vivian’s family, we determined that our first priority and short term focus will be to help give a voice to Vivian's family, to invite people who come across this story to help be a part of the support network for this family by praying and by helping us gather the funds needed to send a family gift to Vivian's grandmother via Compassion. We can send a maximum of $1000 as a family gift, but are hoping to send at least $400. If a few dozen of us give $10, or even $5, we can make a significant long term impact on this family’s well-being by helping this grandmother get a source of income established so she can not only feed her family and meet their needs, but perhaps eventually move out of this area and into a safer, cleaner place for her family to live. She is determined, hardworking and such a strong woman. She will rise above this, she just needs a little extra help to get there. Our family would like to start by contributing the first $50 toward a family gift. Beth has also committed $100 towards a family gift. If you would like to join us, no amount is too small to make an impact. Our Paypal address is JD@beyondmeasure.me or you can contact us for more information or options through this email address as well. Please mark “Vivian” in the subject line. 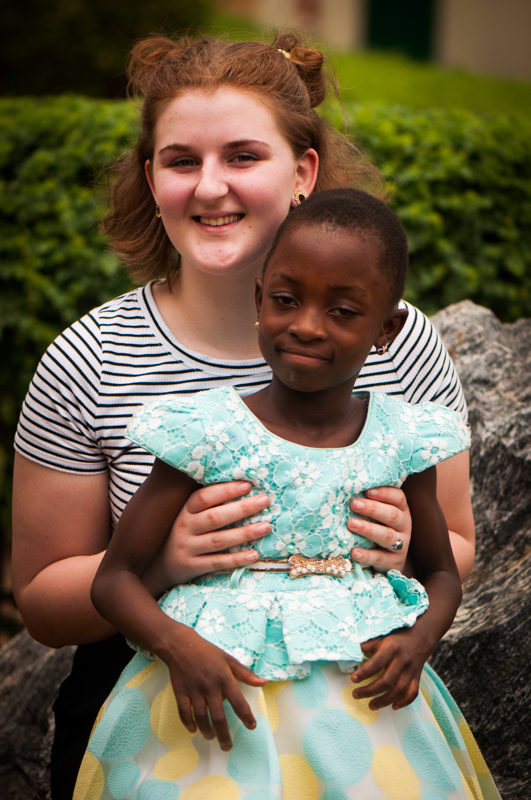 We hope to follow up on Vivian's family the next time we travel to Ghana, and until then, we look forward to hearing updates from Beth, her sponsor. When it comes to my knowledge of home visits, hosting and etiquette in North America, a few thoughts come to mind -- "all thumbs" and "oblivious" competing for first place on that list. Leisurely visits with family, neighbors and friends is at the heart of the Acadian culture that I grew up in. I was always fascinated watching my mama visit with people, an art form that she seemed to have perfected and enjoyed so much, but as an extroverted introvert with a strong underlying current of social anxiety who moved mid-childhood between two very different cultures, I feel all thumbs when it comes to visits, social etiquette and cultural expectations. We had people from the mission team committee for a potluck a few summers ago, and someone asked for a steak knife. I walked over to Will and whispered "Honey, what's a steak knife? Which ones are those? Do we have any?" It skips a generation, it seems. Or, at the least, it skipped me. My mama always had people coming and going at her house almost every day, and was a mother hen to them all. By contrast, I could count on one hand how many times we've had people over in the past 5 years. It was a bittersweet moment in our house when our neighbor's washing machine broke down. I jumped right in and invited them to use ours anytime they needed to. My heart went out to them -- I know how frustrating (and expensive) it is when something breaks down, especially a washing machine in a household with children, but in the same breath, I was admittedly excited and fascinated at the thought that they'd be dropping by often, even if only for a short while. I love our neighbors -- they're the kind of people that would end up coming over more than once even though I'm the world's worst host -- I don't offer coffee, since I don't have any, don't drink any, and wouldn't know how to make it... and would likely forget to even offer it. I'd be so excited someone was in our house that my mind would just go blank. [Ritalin is my friend] They see past my awkwardness and love me in the midst of life being real. Have I mentioned that I love our neighbors? In my mind, Africa was different. After all, it's the land of Hakuna Matata. No worries, right? Africa, a place where I can just relax and be myself and not worry about being all thumbs. 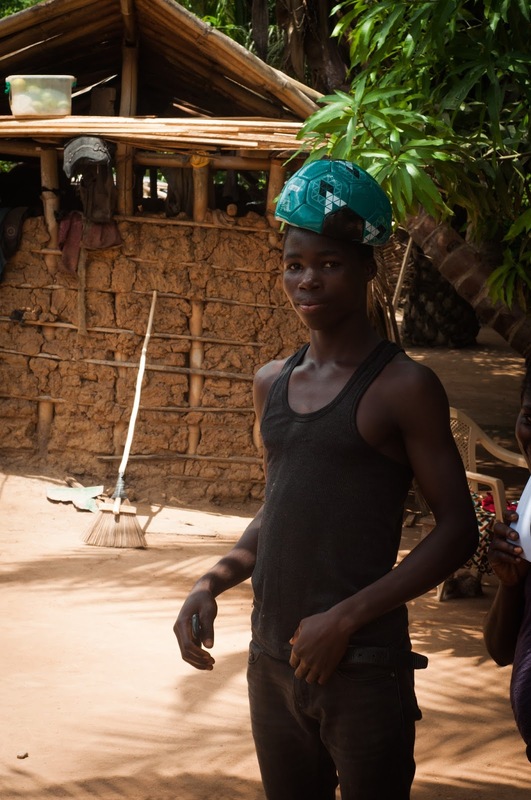 The Ghanaian culture (including the Akan culture in the Central Region where we spend the majority of our time) is particular about the do's and don'ts when it comes to social etiquette. 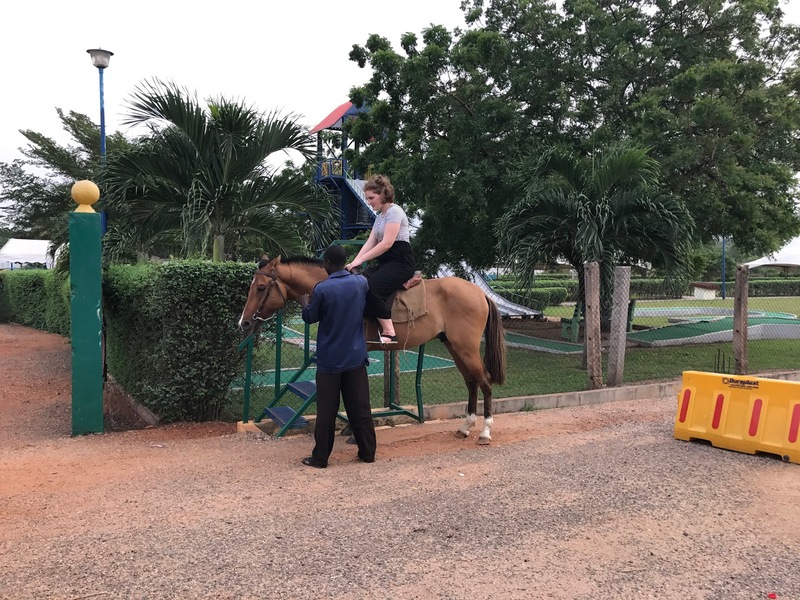 While I still somehow feel very, very relaxed, content, at peace and at home here, my "all thumbs" seem to have hitched a ride with me to Ghana. Our schedule for today was anticipated to go at a pretty hectic pace. Normally, we would do 2, maybe 3 home visits in one day. Since we were visiting 3 of our children, along with 3 children sponsored by friends in the same town or area, we would be doing 6 visits today. Deborah, our host from Compassion Ghana, would help us keep on track. Sensing those "all thumbs" from a mile away, Deborah had to stop me a few times to explain the proper visit protocol for the Akan region. First, prayer. Second.... I already don't remember. Something about elders (I feel old in this heat, does that count?)... third... possibly Ritalin. Needless to say, Deborah was a Godsend. 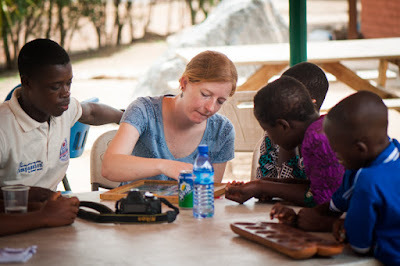 She guided our conversations between our group and the sponsored children's families, and made us all feel at ease, helping translate for the elders who didn't speak English, or for the younger children who had not yet mastered the language or couldn't quite decipher our Canadian accents. After a quick stop at the Greater Grace Community Library to take a closer look without the crowd from yesterday (or the distraction of Jillian passing out), we made our way to Ato Sam's home. We hadn't yet seen his father during our time in Enyan Abaasa. His father had badly broken his leg last June in a car accident and was still recovering. A few minutes after leaving the Library, we pulled up to a dirt yard with a few trees, a small market stand, a school and a partially constructed building. As I looked up, I saw a group of four houses facing each other over a common courtyard, and I recognized it right away. This was Ato Sam's home. I was so excited to finally be there and see his family, and so afraid I'd forget to ask the questions I had jotted down in fear of forgetting to ask them, that all the things I'd learned that morning about etiquette once again flew out the window. Why was this so complicated for me? I hope it was more amusing to them than offensive, but sometimes, I really wonder. Deborah graciously and patiently explained the order we would follow once again, and I tried hard to pay attention to each name that I was introduced to, how to pronounce it, who the name belonged to, and how they were related to Ato Sam... and did I mention he has never really answered me as to how many people are in his family because it's too many to count? By the time the introductions were done, I had forgotten what came next. 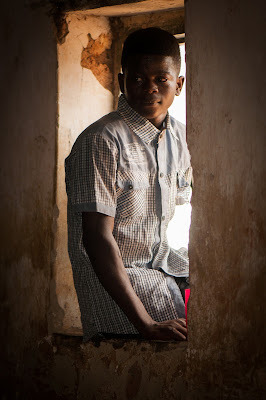 I had specifically chosen to sit by Ato Sam's mother, since I wanted to connect with her on a deeper level. He has amazing parents. His father is patient and kind, wise and educated, disciplined and hard working. His mother is very loving, strong, and wise. They are all struggling since his father has been unable to work because of his injury. They still run their subsistence farm but had to add a market stall to supplement their income. His mother has been bearing the majority of the added work and stress. I was glad we had brought some groceries to help ease their burden, but it seemed like so little in the face of all they had faced in the past 9 months. They seemed to be holding up well, though. They have a strong faith and a strong support network in this community, including the Compassion program, and that has made a tremendous difference. I was able to go through Ato Sam's entire Compassion program file, where every letter, school report, medical record, home visit, gifts and purchases is recorded. His file was one of the biggest we'd see on this trip, mainly due to the large volume of letters and the length of time he'd been sponsored. I even got a chance to see an older photo of him I had not seen before. All too soon, given the full schedule ahead of us, it was time to go. We presented them with some textbooks for the family to use, along with some other educational books. We also gave Ato Sam an engraved Bible with a soccer ball cover, a Bible case, a great quality soccer ball our friend Gigi purchased for him, and a sturdy backpack that should last him through his years of university. The family provided us with fresh bananas from their family and Tahameena's. It was in this visit that I learned that Ato Sam and Tahameena, the other child I sponsor from Enyan Abaasa, are actually cousins. Ato Sam's father is the sibling of one of Tahameena's parents. Her mother, I think. Wait... her father. I will blame my foggy mind on the heat. That should explain everything for this entire trip. As we took a few last photos, prayed together and said goodbye, Ato Sam took my hand and walked slowly with me to the van. We reflected on the visit, and I shared with him how much of a blessing it was to spend time with his family, how proud I was of how well he was communicating, and that I appreciated getting to know his mother a little more. I told him he was very blessed to have two great parents. "I'm getting to know your mother more. I really love her. She's so strong and wise, but also tender and compassionate too. She's a great mother, son." All too soon, we reached the van, where we climbed in and started making our way to Prince's house, a child sponsored by our friend Stephanie and her family. We had visited Prince, his older brother and his mother when we were in Enyan Abaasa in 2011, and were eager to see how Prince had grown and how his family was doing. This would be our second of the 6 visits. We walked down a familiar small open corridor between buildings, side stepping hens and chicks pecking for scraps, and made our way to their cozy courtyard. Prince's oldest brother has moved away for work, but we were able to spend time with Prince and his mother as well as a few relatives and neighbors. Prince is a very charismatic boy -- which is fitting, since both of Steph's girls are equally charismatic. These two families are a perfect fit for each other -- strong, loving, kind, hard working, beautiful and with amazing personalities. He has grown so much since the last time I saw him, but I recognized him right away and wrapped my arms around him in a big hug. Prince and his beautiful mama. We found seats in the shade inside the courtyard surrounded by doors leading into various rooms/homes, and followed Deborah's lead and exchanged greetings and information in the prescribed order, much as we would attempt to do once again in the next 4 visits. I managed to avoid awkwardness somewhat, and even got some laughs when I turned to Prince and asked if he was working very hard to help his mama now that his older brother had moved away and Prince was now the "man of the house"? He gave me a cheeky grin, and dramatically nodded his head, affirming that he was most helpful, while the twinkle in his eye completely contradicted his every attempt to convince us. We all burst out laughing. He and Jillian would make GREAT friends. After presenting our gifts of groceries and a soccer ball to Prince and his mother, we took some group photos and a few photos of him and his mama, and I asked if he would be willing to say a few words to Steph and her family on video for them, since I really wanted them to hear his voice and see how sweet a boy he really is. He did not hesitate one bit. As we made our way back to the van after our visit, we ran into his lively grandmother, who wanted to shake our hands and have her photo taken. Charismatic personalities run deep in this family! 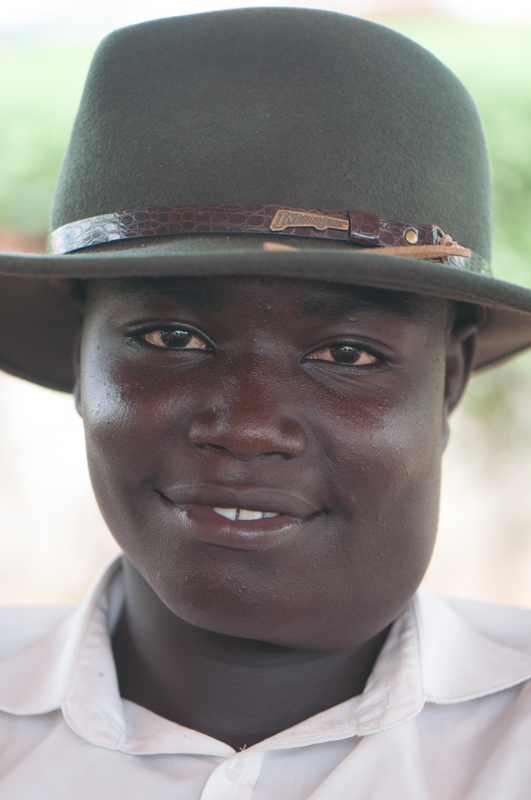 We asked Ato Sam to take on a mentorship role for Prince, now that Prince's brother had moved on, leaving Prince without an older male influence in their home. He would need a good role model, an older brother to watch out for him and encourage him, and with Ato Sam being a great leader, it seemed like the perfect fit. All too soon, it was once again time to say goodbye so that we would have time to move forward to the next 4 home visits. All I remember from visiting Tahameena's home in 2011 was the rustic outdoor kitchen, how beautiful these people were, giving our meager offerings to them while surrounded by a crowd of relatives -- standing room only. Although Ato Sam and Prince's homes were somewhat similar in both structure and placement, Tahameena's home seemed a little more rustic and rural, with mud walls and a handmade roof. 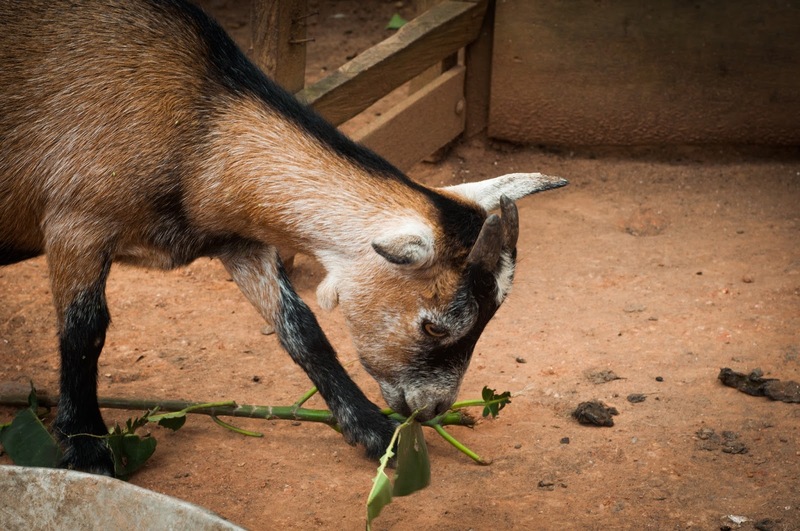 The cooking was done outdoors, and the well-kept yard was fenced to keep their small herd of goats from wandering and destroying crops. Nearby, a crop of palm nuts were drying in the sun. The tall coconut trees overhead offered welcomed shade as we sat together and began the social rituals. I could have picked the yard of Tahameena's home in a photo lineup, even though I could barely pick her out of a group of girls just yesterday. Seems somewhat cruel to have a heart for people and a calling to reach them, and have a photographic memory for places but not faces. It certainly added an interesting element to my feelings of inadequacy and social awkwardness. As the introductions began, I noticed a familiar face in the crowd -- but couldn't quite place him, until I saw his foot.... Ato Sam's father! He had made his way here somehow as he did the last time we were at Tahameena's, and extended his visit with us by joining in. Yes, I can pick out Ato Sam in a crowd with his back to me, but cannot recognize his father after having sat across from him for an hour.... a mere hour ago. Keeping it real, folks, keeping it real. 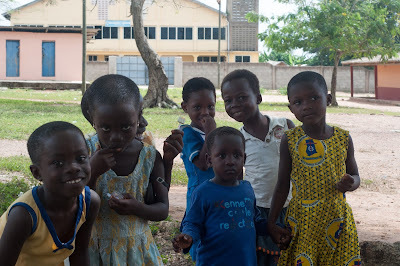 In Akan culture, it is common for children to be given names based on the day of the week they were born, as well as birth order and family names. For example, Ato means "male born on a Saturday", while Sam is a family name that nearly everyone in his family carries. 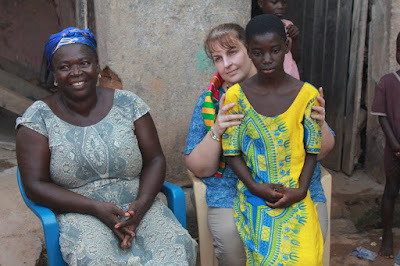 When Jillian introduced herself, she also shared that she had been given a Ghanian name shortly after arriving in Ghana. "Ama" was her new Ghanaian name. The group told Jillian that Ama means "Born on a Thursday". I laughed and explained that Jillian was born on a Sunday, but that the person who had named Jillian "Ama" said it also meant "daughter of the queen", which meant that really, they named Jillian "Princess". They wondered which days Will and I were born, so I shared that Will was also born on a Sunday, and they said his name might have ended up being Kwesi or other variants. Mine, having been born on a Wednesday, would have likely been Akua or Akuba. As our introductions wrapped up, once again with too many names and faces to memorize, we were served fresh coconuts from their yard, which we got to see them prepare for us. They're quite skilled with machetes. 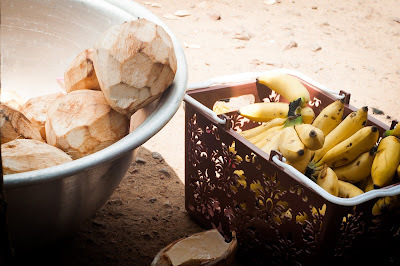 The coconut milk was so fresh and so refreshing in the rising heat, but given that we're used to eating hardened coconut back home, I couldn't quite get into the soft, almost rubbery coconut once I had finished the coconut milk. The texture isn't anything like we're used to. Given that our stomachs were still adjusting to the new foods and experiences, I didn't want to take a chance, especially without guaranteeing that my hands were clean enough. I hope that wasn't yet another faux pax for the Canadian team. The bananas, though, were absolutely perfect. Just the right size for a sweet snack, and oh-so-fresh! Tahameena's family grew by one since we last saw her. She is no longer the only girl in a family with 3 boys -- she now has a little sister, who is now 4, and is well surrounded by extended family, including Ato Sam's family. Her older brothers really enjoyed getting to meet Jillian, and all insisted on having individual "selfies" taken with her as we prepared to leave. We lingered over our goodbyes and a few more photos as we headed towards the van. We must have hugged everyone at least once or twice. Hadn't we just arrived? Our goodbyes were eased knowing that we would see Tahameena again the next day in Accra. Climbing into the van once more, we made our way to a house I'd never been to before. A young boy named Isaac lives there with his family, and he is sponsored by my co-worker named Nathan, a sweet bear of a man with a heart as big as Texas. 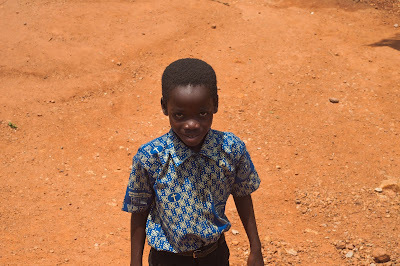 This was his first sponsored child, and he chose Isaac knowing Isaac lived in the same community as the library and that there would be a personal connection since we had been involved with this community for years. I wasn't sure what to expect, since I did not know much about Isaac or his family, but I immediately felt welcomed when we arrived and made our way down the steep path to their shaded yard. Waiting for us was Isaac and his family, including many uncles and grandchildren. The grandchildren were quietly observing all of us "obrunis" from a distance, not quite sure what to think. It's quite probable that we were the first obruni people they'd seen, or at least the first ones who had visited them at their home. For the first few minutes, while we exchanged introductions and explained who we were and why we were there, Isaac sat quietly staring at the photos of Nathan I had brought for him, in awe and wonder. His sponsor!!! Yes, we were there, in person, on behalf of Nathan, but to young Isaac, the world stood still when he looked at the pictures of Nathan. 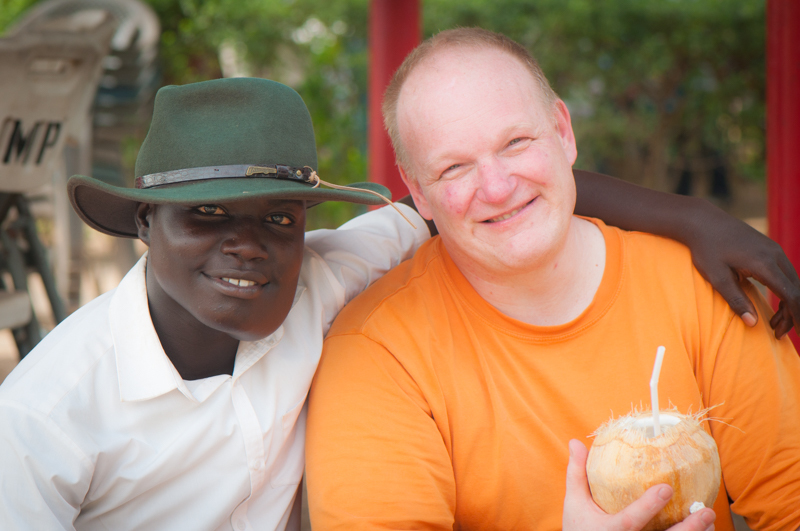 It was the first time he'd seen a photo of his sponsor, since it had only been a few months since Nathan began sponsoring Isaac. Looking through Isaac's file, I was surprised to see he had been sponsored by someone else the month before Nathan began sponsoring him, and by yet another sponsor a few months prior to that. It seemed as though Isaac had been chosen and let go several times, certainly causing confusion and disappointment for this precious boy. I told them that Nathan was a very committed sponsor, that he loved Isaac very much, and that God willing, they'd have a long time to get to know each other. Given how new this experience is for Nathan, and how common it is for people from North America to wonder if these kids are real, I wanted to get a video of Isaac so that Nathan could see him on a more personal level and in a whole new dimension. It would also be sweet to have a video recording of his voice for Nathan to hear. Since Isaac is still learning English, we had to help him a bit, but in just two takes, he was able to deliver his message to Nathan. Isn't he sweet? His entire family was watching intently. I can't help but wonder what went through their minds. It had to be somewhat surreal. 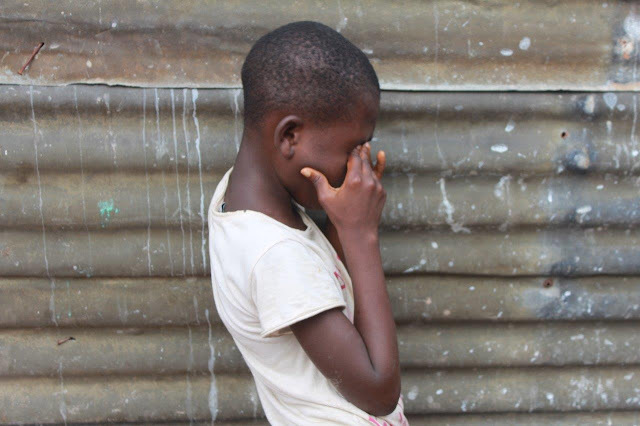 One day you get the news your child has been chosen for sponsorship, and before you get the chance to wonder if this sponsor will also "unchoose" this child, someone arrives representing that sponsor and carrying a message that this sponsor cares VERY much about this child and is committed to being the sponsor to this child. It really was an honor to be there on Nathan's behalf, being a messenger of his love for this child and the family. 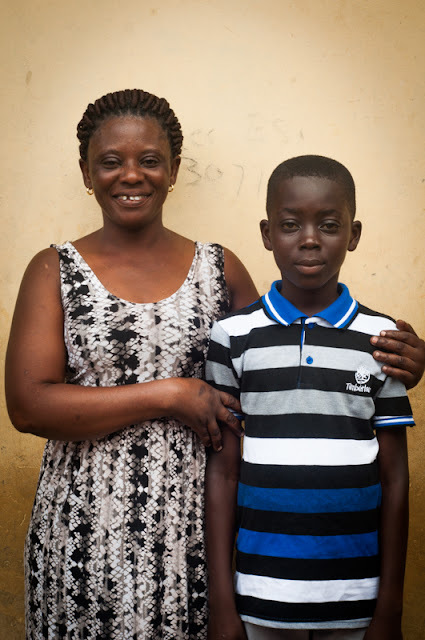 We asked Isaac's family to share their hopes and dreams for Isaac's future, and they shared their desire for him to get a full education. They expressed their gratitude many times for our visit and encouragement, their demeanor so kind, gentle and good natured. We had brought groceries and a soccer ball for them, much as we did for Prince and his family, and we presented these to them. The ball was not inflated, since we needed to pack it for travel and had forgotten to bring along the pump, but we knew they'd find a pump easily and get the ball inflated and ready for the kids to play with. The older kids used it as a hat in the meantime, making us all chuckle. Isaac followed us as we made our way back to the van, and stood in wonder as we waved goodbye. I'm sure that, like us, he's still trying to process the experience. We wouldn't get the time to process much for a while, as we were about to leave Enyan Abaasa for the last time on this leg of the journey, en route to our 5th home visit.